Machined from solid Acetal Rod that helps the Shadow 2 make weight in Carry Optics. The stock stainless steel factory guide is very heavy at .80 ounce. The new CGW Acetal rod is an amazing .013 ounce. NOTE: This guide rod is full length and only fits the Shadow 2. CGW bucks tradition by not using an injection mold to make this part. 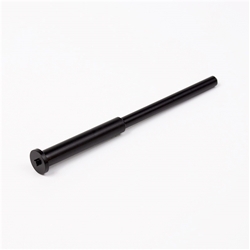 We start with a solid rod of super tough, light weight Acetal, and machine it to shape. The rod is beautifully made and fits perfectly in the Shadow 2.